Home Banking How to Check Canara Bank Account balance? 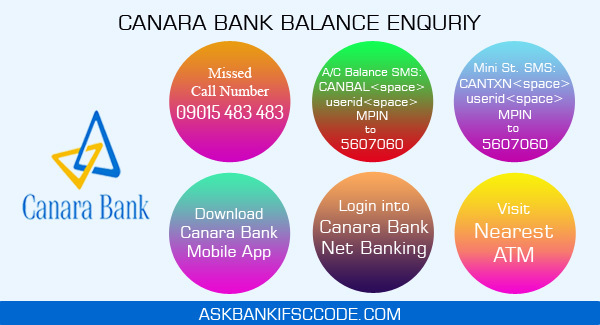 How to Check Canara Bank Account balance? To maintain a proper ledger of the money you need to know how much bank balance you have. For that, you can use ATM machines or Passbook update but it is time-consuming. Therefore, To save time and easy banking Canara Bank provides various method to check Account Balance for Canara bank customers. Canara Bank is one of the largest banks in the country. It was established in 1906 in Mangalore making it one of the oldest banks in the country. The bank had a network of 6639 branches and more than 10600 ATMs spread across all over India. Canara Bank provides Account Balance check by following ways. Canara Bank has launched its app called Canara Bank Swipe that enables its users to experience all the banking services in this single apps. The download link of the app is given below. Canara Bank through their internet services provides a net banking facility with many other features. Apart from transferring funds, you can also check Canara Bank Account Balance by Login to Canara Bank Net Banking. ATM Machines provides free balance check facilities. You can use it in any bank ATM, all the bank ATM Machines can be used to check the balance. How to check the balance? Insert your ATM card into an ATM- Machines will allow you to check your balance for free. Type in your PIN on the machine- A four-digit number you should have set up when you opened your account. Select the option to view your balance- You will be able to go back and make a withdrawal or print that balance. What is Paytm Money App? What is Bajaj Finserv EMI Network Card? How to Pay LIC Premium Online? How LIC Policy Can Save You Income Tax? How to Get Loan against LIC Policy? Original VS Fake Currency and What to do if You Have Fake Currency? Top 5 Reasons LIC Insurance Claim Can Be Rejected? How to Surrender LIC Policy before Maturity? What is Gratuity and How to Calculate Gratuity? How to Claim LIC Maturity Amount?